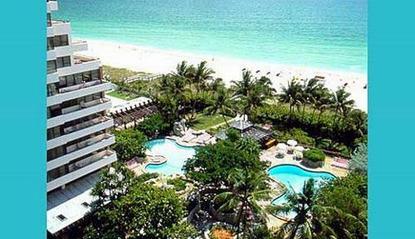 The Alexander All Suite Ocean Front Resort is situated in the heart of Miami Beach's celebrated Millionaires' Row. The hotel is conveniently located just minutes from South Beach and the Art Deco District, Bal Harbour shops, downtown Miami, the Miami Beach Convention Center and 12 miles east of the Miami International Airport. The Alexander All Suite Ocean Front Resort is home to many celebs and families a like. Our ocean and bay view suites provide excellent relaxation for those weekend getaways. For groups, we offer 10,000 square feet of meeting space with which we can accommodate groups from 10 to 350 people. Enjoy dining at Shula's Steakhouse or the Top of the Falls. All suites have private balconies with wonderful views.